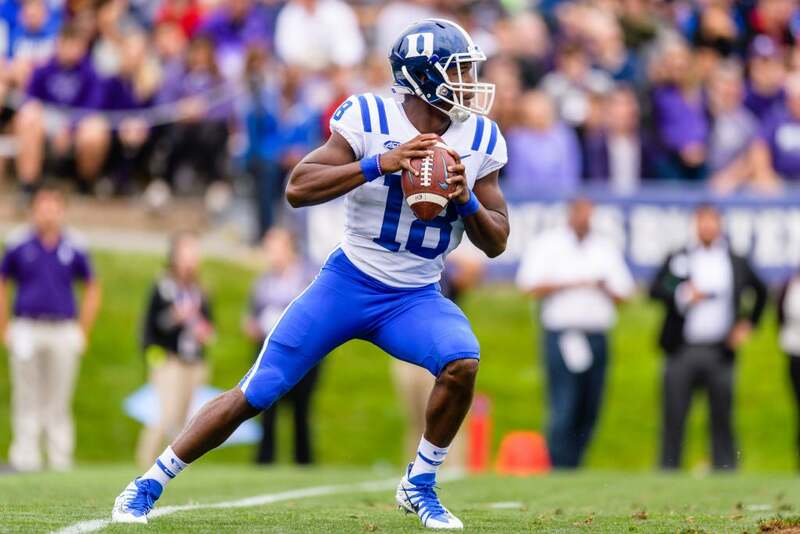 If Duke quarterback Quentin Harris can command a huddle the way he wins a media session, add that to the head starts on 2019 he gained with playing time last year when third-year starter Daniel Jones was injured for two-and-a-half games. It’s not just what Harris, a 6-foot-1, 195-pound redshirt senior from Taft School in Wilton, Conn., says answering questions, it’s how he says it. He speaks with the polished delivery of a veteran and thoughtful politician. He might have said “uh” once when he met with the media Tuesday the first time this spring – uh, that's maybe once. There were more “uhs” and “ahs” from the veterans in the sports media peppering Harris with questions than in his responses. The sports media members went home the “Wizard of Ahs.” When you read quotes in stories from interviews, know that "uhs" and "ahs" from athletes and coaches are edited out as a nuisance to a story's flow. That's not necessary with Harris. The first question was about the experience he gained last season aiding his transition to full-time starter. Harris finished off a 21-7 win at Northwestern after Jones went down late in the second quarter and followed by winning the next two games as the starter at Baylor (40-27) and at home against N.C. Central (55-13). This is a new role for Harris to meet routinely with the media that comes with the job as the No. 1 quarterback, but he didn’t ponder his thoughts while handling his new task. Mental and physical confidence always helps performance, and Harris has a head start on Jones in both areas. Jones was thrust into the starting role as a redshirt freshman in 2016 when returning starter Thomas Sirk suffered a season-ending injury just a couple weeks before the first game. Jones was a like a deer in the headlights the first time he met with the media before he gradually grew comfortable with the role. That doesn’t mean he lacked command of the huddle, but every advantage helps in sports. Harris is ahead on that particular learning curve. Harris finished the year completing 34-of-68 passes for 437 yards seven touchdowns and one interception while taking snaps in 12 of 13 games. His QB rating was actually higher than Jones, 135.01 to 131.69, although admittedly it was smaller sample size. In the Northwestern game, Harris’ job was the preserve the 21-7 halftime lead. His finals stats were only 2-of-2 passing for 12 yards and five rushes for a net 14 yards (he had a long of 25), but what mattered most was no turnovers. He took care of the ball. Returning home against N.C. Central, he not only was 15-of-27 for 202 yards with three touchdowns and no interceptions, the 48-13 lead after three quarters. The rout allowed playing time for Chris Katrenick, last year’s No. 3. He was 5-of-12 for 54 yards without an interception. Jones returned sooner than expected for the Virginia Tech game, but Harris is solidly cast in the No. 1 role as long as he continues to progress. Not even the thought of opening the season against the Alabama Death Star on Aug. 31 in the Chick-fil-A Kickoff Bowl at Atlanta’s Mercedes-Benz Stadium gives him pause. For him, speaking and explaining is the easy part. The next step is translating thoughts to plays on the field, but at least we know he has a head start on his predecessor.